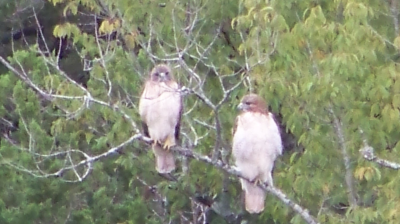 I was on a conference call this morning when I spotted these two gorgeous birds of prey in the canyon below my house. In this picture, you might see two tiny dots right in the center of the frame. This is about 500m away, with no zoom. In the next frame, you can see the birds a bit more clearly, at 12x zoom. With digital enhancement to 36x, you can see these are truly huge, beautiful birds. Can anyone identify what type of bird they are? 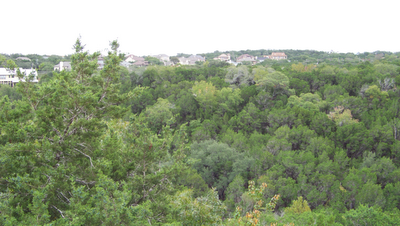 This is in Austin, Texas, for what it's worth. Perhaps a little too white to be an eagle or an osprey. A hawk or a falcon of some kind? I think this was solved in the comments below... A red-tailed hawk, it must be! 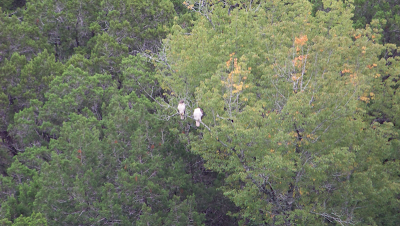 Looks like a type of red-tailed hawk, which are common throughout Texas.